This article is about the current train operating company. For the historical company, see London and North Eastern Railway. For the former train operating company, see Virgin Trains East Coast. London North Eastern Railway (LNER) is a British train operating company that operates the InterCity East Coast franchise. LNER operates long-distance inter-city services on the East Coast Main Line, which runs from London King's Cross to North East England and Scotland. It manages 11 stations itself and its trains call at 53 stations in total. The company is owned by the Department for Transport (DfT). LNER took over the InterCity East Coast franchise in June 2018, after the previous privately owned operator Virgin Trains East Coast returned it to the government following sustained financial difficulties. The DfT intend for the company to provide services until a new public-private partnership can be established in 2020. In November 2017, the Secretary of State for Transport, Chris Grayling, announced the early termination of the InterCity East Coast franchise in 2020, three years ahead of schedule, following losses on the route by operator Virgin Trains East Coast (VTEC), who had been due to pay more than £2 billion in franchise premiums to the government over the last four years of its contract. This was brought forward in February 2018 to mid-2018. The Department for Transport (DfT) decided to either negotiate a deal with VTEC to continue to run the franchise on a temporary non-profit basis while a new franchise competition was conducted, or to arrange for VTEC be taken over by the DfT's operator of last resort. On 16 May 2018 it was announced that the latter had been decided and that LNER would take over from VTEC on 24 June 2018. The DfT also announced that LNER would be the long-term brand applied to the InterCity East Coast franchise. As part of the overall strategy for the East Coast franchise, the Secretary of State for Transport stated that Great Northern services could potentially be integrated into the operation when the Thameslink Southern & Great Northern franchise expires in 2021. LNER is the second time that a government appointed operator of last resort has taken control of the InterCity East Coast franchise; between 2009 and 2015 the franchise was operated by East Coast following National Express East Coast defaulting. The company's name echoes that of the London and North Eastern Railway, one of the "Big Four" companies which operated between 1923 and 1948. 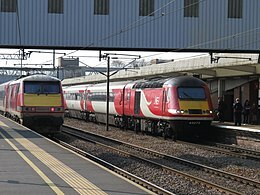 Future destinations include a proposed service to Middlesbrough, though the Rail Minister, Jo Johnson, told Parliament that it was dependent on the Azuma's being brought into service on the ECML and other schemes in progress that would provide sufficient capacity to enable the service to run. An additional constraint is the lack of a suitably long enough platform at Middlesbrough, which would necessitate a new build at an estimated cost of £20 million. Flying Scotsman Edinburgh Waverley London King's Cross Service began 1862 in both directions; named by LNER in 1924. Now Edinburgh to London and only stops at Newcastle railway station for a driver/crew swap. West Riding Limited Bradford Forster Square London King's Cross Operates from Bradford to London only. LNER inherited a fleet of InterCity 125 and InterCity 225s from Virgin Trains East Coast. Since September 2016, Virgin Trains East Coast had hired three Class 90s from DB Cargo for use on services to Newark, York and Leeds. LNER has inherited these locomotives and is expected to retain them for the foreseeable future to cover for the current shortage of Class 91 locomotives. InterCity 225 Class 90 Electric locomotive 110 177 6 A short term hire-in from DB Cargo to cover for a shortfall in Class 91s. Usually 1 or 2 supplied from a pool of 6. The current fleet is scheduled to be replaced by Class 800/Class 801 high-speed trains from May 2019. These will operate in 9-carriage and 5-carriage sets. ^ "East coast main line trains back in public hands again next month". Retrieved 16 May 2018. ^ "LNER". www.lnerailway.co.uk. Retrieved 16 May 2018. ^ "Short-term Intercity East Coast train operator 2018 options report" (PDF). May 2018. p. 20 (numbered 16). ^ "East Coast rail change confirmed". BBC News Online. 5 November 2009. Retrieved 16 May 2018. ^ "Stagecoach and Virgin win East Coast mainline rail franchise". BBC News. 27 November 2014. Retrieved 16 May 2018. ^ Harris, Nigel, ed. (26 September 2018). "Plan for Azuma's to Middlesbrough". Rail Magazine. No. 862. Peterborough: Bauer Media. p. 21. ISSN 0953-4563. ^ Johnston, Howard (24 October 2018). "Regional News". Rail Magazine. No. 864. Peterborough: Bauer Media. p. 26. ISSN 0953-4563.